There are concerns about flooding, and that's already stressful, but now on top of that, people also have to worry about scams. Scammers in the area are trying to trick people out of their homes and personal information. City officials are warning citizens because as Florence continues to churn, people are taking advantage of the havoc hurricanes cause. The scams target areas are where officials have issued a mandatory evacuation order. There are concerns about flooding, and that’s already stressful, but now on top of that, people also have to worry about scams. Kira Cook’s experience started with a voicemail. “That wanted to confirm that we had evacuated, that all residents living in Zone A had evacuated,” she described. The message asked for personal information for a reason that would peak the interest of anyone considering evacuating in a hurricane. “So that they could reimburse evacuation costs,” she recalled. For Kira, the message raised something else. “I don't live in Zone A, so that was the first red flag,” she noted. Citizens notified Norfolk officials of other red flags in Ocean View. 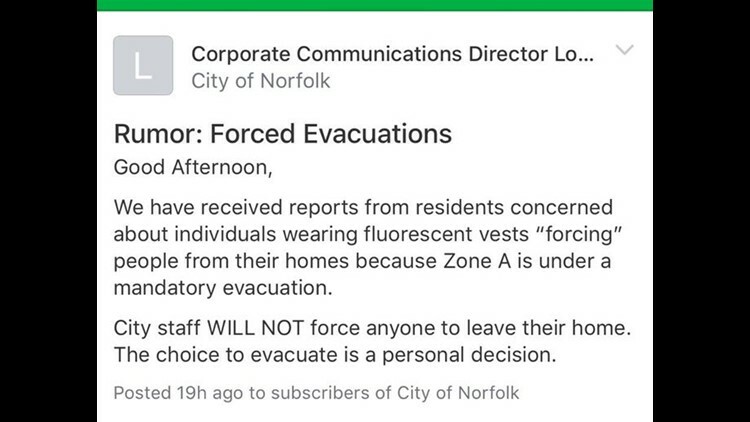 They reported people wearing fluorescent vests trying to force them from their homes because they live in Zone A.
It’s a sad lesson—storms like Florence can sometimes bring out the worst in people. “What I always tell people if the hair on the back of your neck stands up, if it just doesn't seem right, go with that feeling,” advised Norfolk Police Officer JoAnn Hughes. That’s a good tip to follow because as a lawyer, Kira knows there are consequences if you fall victim to one of these scams. That’s why she spoke out. “You're trying to prevent it on the front end because on the back end there's very little we can do,” she added. Norfolk patrol officers in the area are looking out for any of these scammers. If you have questions about someone who wants your information, ask to see credentials and call police or city officials.